It is always interesting how children construct their own games to suit a situation. In the toybox outside, my granddaughter discovered a small net once used long ago in the maintenance of a fishtank . “Let’s play a fishing game,” she announced to her cousins. “We need some water please Gam,” they called. 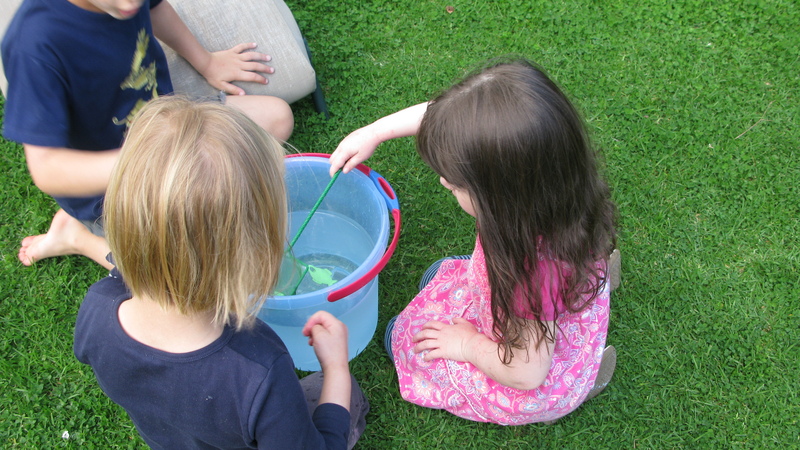 So with a bucket of water and a variety of articles which could float, the fishing game was instigated. This kept them amused for over an hour as they took turns, counted how many items they caught, and fantasised about the size and type of fish they were catching. Imaginative, child centred and inexpensive entertainment. I always loved to watch my kids’ imaginations at work! It is nice to buy things for them, but they need to be able to play even without expensive toys. Found objects can be so much fun!